The 10 Best Fusion Restaurants in Maine! Maine’s foodie culture is among the most impressive in the country. With fresh seafood and hundreds of organic farmers, there is a reason top chefs are leaving major cities across the U.S. to open restaurants in Maine. And, Mainers are sure loving it! Here are the 10 best fusion restaurants in the state. With communal seating, the Honey Paw in Portland offers fun East meets Maine dishes perfect for the whole family. 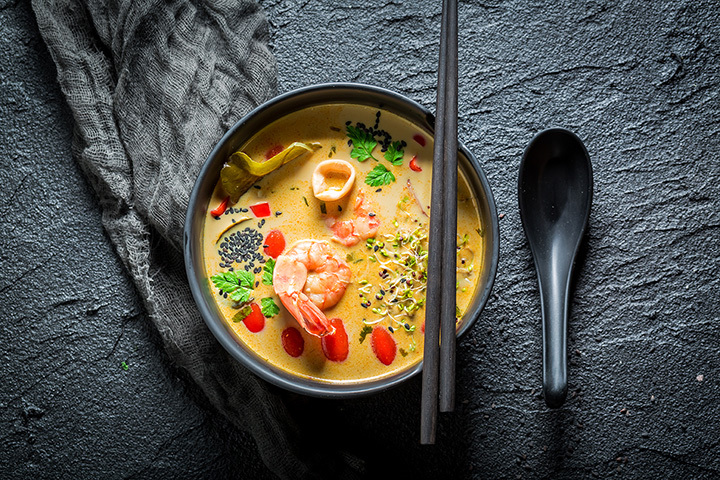 With dishes like lobster laksa and lobster wontons, you can see and taste the fusion. Prices are a bit more on the expensive side, but Honey Paw is worth the visit. Jasmine Café in Auburn serves up a real mix of dishes from Thai to sushi to bento boxes to Vietnamese and everything in between. Either dine in, take out, or call for delivery. The menu is extensive and contains dishes like fried rice, seafood, curry, and soups and salads. Orchid Restaurant is a popular Asian fusion restaurant in the Lewiston/Auburn community serving a mix of Thai, sushi, and Vietnamese dishes. Choose from traditional dishes like Pad Thai, red curry or California roll. Their sushi menu is quite creative and will leave you full all day long. Located in Yarmouth, the Woodhull Public House is a hip bar meets Asian fusion restaurant. With an extensive list of local craft brews and a menu filled with traditional Asian dishes and tacos, you’ll find the perfect meal to complement your drink choice. Tao Yuan Restaurant in Brunswick uses fresh local ingredients, Asian flavors, and modern cooking techniques to produce delicious Asian fusion dishes. Dishes are served small dish style so order as many as you can to taste as much as you can. Your taste buds will thank you later. Opened in 2009, Long Grain uses local ingredients to make “honest food.” While primarily a Thai restaurant, Long Grain also serves Vietnamese, Indonesian, and Japanese style dishes similar to what you’ll eat if you were traveling around South East Asia. Using fresh local ingredients, Boda serves various Vietnamese and Thai dishes with a French twist. You’ll find everything from bubble tea to pho to dumplings. As a reasonably priced restaurant, you can eat a very filling meal here. Located in the historic Danforth Inn in Portland, Temp Dulu serves fusion dishes by executive chef Michael McDonnell from Vietnam, Thailand, Malaysia, Singapore, and Indonesia using all locally sourced Maine ingredients. Of course, you’ll find plenty of Maine lobster on the menu. Unlike some of the restaurants on this list, Blaze serves up a unique fusion menu of Italian, Mexican, and American dishes. From specialty tacos to lobster mac n’ cheese to brick oven pizza, you’ll find delicious comfort food at Blaze. Café de Bangkok in historic Hallowell serves a mix of Thai and sushi dishes. You’ll find traditional Thai dishes like Tom Yum Soup, Duck Chu-Chee, and plenty of sushi options using fresh Maine ingredients.